We can supply good quality Plastic + Aluminium Laminated Tubes in various sizes. Multi-layer tubes with Aluminium foil / EVOH / nylon / polyester act as barrier against oxygen, moisture, aroma loss and provide a glossy Surface enhancing printing quality. Optional barriers can be applied to the shoulder for the same purpose. Transparent stretch polypropylene and PET tubes with dispenser caps are designed to meet specific requirements, of the food & cosmetic industry. Seamless five layers or plastic with EVOH/nylon as barrier material are useful for the cosmetic & pharmaceutical industry. Hot foil stamping on laminate in addition to 9 colour printing with a varnish coat enhances product image. Length of the tube can vary from 80 to 200 mm. Shoulders can be different shapes. Different caps such as conical, flip-top, standi and the like can be custom designed for an aesthetic look. Owing to our vast manufacturing facilities, we are able to offer our clients a wide range of Plastic Laminated Tubes. These laminated tubes are manufactured using excellent quality plastic at par with industry set guidelines. 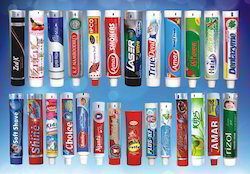 Our offered range of products are extensively used in packaging of toothpastes, medicines, skin care products and paint colors. Further, these products are fabricated under the strict vigilance of our professionals. Moreover, each of our products are stringently tested on various parameters by our quality controllers and experts. Seamless five layers or plastic with EVOH / nylon as barrier material are useful for the cosmetic & pharmaceutical industry. 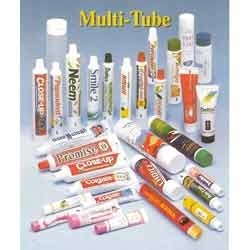 Looking for Plastic Laminated Tubes ?